If you don't know much about outdoor cat enclosures, no problem. Here are some things that might help you to determine if an enclosure is a good idea for your cat. While many people have to keep their cats indoors for safety reasons all cats like to have at least a taste of the outdoors. If you want to treat your cat to a little time outdoors without compromising his safety there are some solutions available. Outdoor cat enclosures give your cat the freedom of being outside while still maintaining the same safe environment that he has when he's indoors. Cats naturally want to be outside to run and play, chase birds, catch bugs and do all the other crazy exciting things they love to do. By installing an outdoor cat run or enclosure, you can provide your cat with a safe way to do these things. You won't have to worry about your cat running out into traffic, getting snatched up by someone or have him get into a fight with another cat and become infected with a disease. This is the most common enclosure used today. It can be easily dismantled and stored when it's not in use. It isn't very sturdy, so there is a possibility of your cat breaking through the mesh. For this reason it's a good idea to check to make sure the mesh is strong enough to hold your cat. These types of enclosures are expandable and can have other components added on, such as tunnels. Some people refer to these as cat cages. This type of enclosure is built sturdier and is meant to be more permanent. There is less risk of your cat escaping in these than in other enclosures. These are great for people who don't have a yard. They can be secured with either Velcro fasteners or with metal wall braces. This is a window extension that fits into a window frame. They are made of thick polyethylene or acrylic. These enclosures will give your cat three or four different views to look at. One downside to these is their size; they're quite small and can only accommodate one cat. Many people believe that this is the best type of enclosure, but you do need to have a yard to use it. 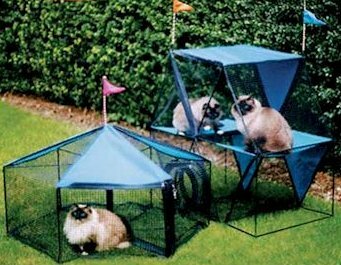 With these enclosures your cat can play on the grass outside without any issues. Outdoor fence enclosures come in a couple of different styles, including an invisible fence which requires no wiring and easy setup. There are also underground fences that do require wiring, but they are relatively simple to install. Is there an area in your home that's off limits to your cat? An indoor cat fence will help you keep your cat where you want him. These enclosures are easy to install. They use a small transmitter with a range from 2 feet to 10 feet. How to Keep Your Outdoor Cat Enclosure at a Comfortable Temperature? There are a few things you can do to heat your cat enclosure and keep your cat more comfortable. Use a heated bed for indoor/outdoor use. Make sure that it's made to be out in various weather conditions. These should keep warm for about 12 hours. Install a light fixture and use a 75-100 watt incandescent bulb. Put a metal covering over the bulb to reduce any glare, and also to keep your cat from touching the bulb. Get a brooder lamp. These are available at feed stores. They can provide enough heat for a space of 8x8. These lamps are safe to leave on all night. Place an indoor/outdoor radiant heater on the wall. This will give off enough heat for an area of 10x10. Another solution is to install an under floor radiant heating system. The heat is contained beneath the floor with no hot items above it so cat doesn't get hurt. Since these can cost several thousand dollars to have installed, they are generally more suitable for catteries.